Applying decades of computation leadership to your solutions. 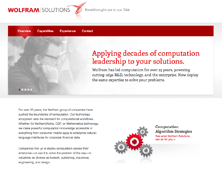 Wolfram has led computation for three decades, powering cutting-edge R&D, technology, and the enterprise. Now deploy the same expertise to solve your problems. Wolfram believes in the power of using computation to deliver innovation, both for our products and technologies, and now for your solutions. No matter what the field, there is always a common thread to our work: find the breakthrough computational solution for our clients that only Wolfram can deliver. Good at executing... on the best solution. Our consultants combine computation with world-class project execution and human intuition to create the kinds of breakthroughs for our clients that few others could provide. We're only at the start of what's possible with computation. We're right at the beginning of the ubiquitous computation revolution. 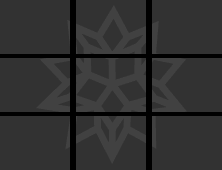 Wolfram Solutions will get you on board now for the journey ahead. For three decades, the Wolfram group of companies have pushed the boundaries of computation. Our technology ecosystem sets the standard for computational workflows. Whether it's Wolfram|Alpha, CDF or Mathematica technology, we make powerful computation+knowledge accessible in everything from consumer mobile apps to enterprise natural-language interfaces for corporate financial data. Companies hire us to deploy computation across their enterprise—or use it to solve the problem of the day—in industries as diverse as biotech, publishing, insurance, engineering and design. Computation powers breakthroughs, and breakthroughs are in our DNA. 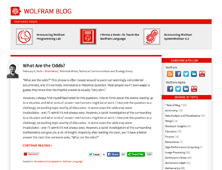 Learn what Wolfram Solutions can do for you. Read about our people, culture and approach to consulting. 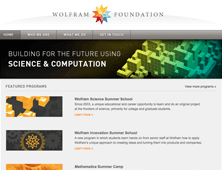 What can Wolfram Solutions do for you? Share your challenges with our experts.